Elizabeth Bui finds fur flying over claims that our wildcat may just be one big pussycat. Question: When is a wildcat not a wildcat? Answer: Nobody really knows. Or more to the point, according to new research by Scottish National Heritage, nobody really knows if a wildcat really is a wildcat anymore. 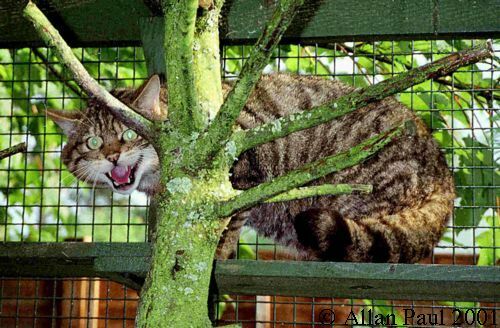 The report, written by David Balharry and Michael Daniels, casts fresh doubt on whether the animal we think as the Scottish wildcat is truly a descendent of the cat that first arrived in Britain some 10,000 years ago, or wether it has become so hybridised through inter-breeding with the domestic cat that was brought to this island 2000 years ago by the Romans that it has evolved into something else. Indeed it is suggested that the wildcat found in Scotland today represents a number of hybrids - from some cats which are relatively close to the feral domestic cat to others at the other end of the scale which are closer to the original ancestral wildcat. The report's author's go further, however, questioning wether the "type specimen" identified in 1907 against which all other wildcats have since been measured for classification was incorrectly defined. The findings of the report are likely to be disputed, not only by amateur naturalists who claim to have a distinct new line of wildcat, dubbed the Kellas cat, in recent years, but also by experts such as Dr. Alex Kitchener of the Royal Museum of Scotland. Dr. Kitchener remains confident that the type specimen felis silvestris grampia identified in 1907 was not plucked out of the air but reflected distinct characteristics for distinguishing wildcats from domestic cats that had been studied for a number of years. He added that recent work done by his department and elsewhere had moved the debate forward and had even produced further evidence to support the argument of a distinct wildcat by using, among other criteria, a test on the jaw bone of the cat which showed that the wildcat's jaw bone could be made to stand upright whereas a domestic cats could not. The significance of the debate lies in the wildcats current protected status under the Wildlife and Countryside act. SNH commissioned the report for two reasons: the first was in a response to a suggestion by the Joint Nature Conservation Committee that "wildcat hybrid (of wildcat appearance.)" should be added to schedule 5 of the act on the basis that protecting "hybrids" would plug a loophole in the legislation whereby "wildcats" could be persecuted with impunity because of the difficulty in distinguishing them from feral (wild living) domestic cats or from hybrids between domestic cats and wildcats. The JNCC proposal was rejected by the government, but the debate has continued unabated. Further evidence of difficulties surrounding legal protection of wildcats followed a court case at Stonehaven Sheriff Court in May 1990 when a defendant was acquitted of killing three "wildcats" because an expert witness could not say "beyond reasonable doubt" that the animals were indeed "wildcats." SNH therefore set out to review the origin, history, and definition of the "wildcat"; investigate and assess the variation found within contemporary wild living cat populations in Scotland; and to identify criteria that could be used to determine wether a distinct "wildcat" existed today. Dr. Maira Cooper, advisory officer in habitats and species at SNH, said that in essence the report had found that though there might be a wildcat out there, what we thought of as the traditional wildcat would have had to have existed fairly separately from any domestic cat or human being, and the chances of that happening in Scotland were fairly remote. "We cannot say for certain there is not one because we cannot prove that. The problem is to work out how much the genetics of the wildcat have been diluted by the domestic cat," she said. SNH has also commissioned research on wildcat genetics, which involve DNA testing, but that work has not yet been reported. For this report, SNH looked at characteristics such as pelage (fur markings), and skeletal and intestine measurements. Despite finding that a morphologically distinct (different) body size existed, it concluded: "There is no evidence to link this large group as being a remnant of the ancestral type." It added: "Practically, for the purposes of conservation management, this distinct group might be more the result of current day selection pressures rather than the discovery of a refugium of an ancestral type. However this is somewhat an academic debate and should not effect the conservation value of the 'wildcat'. What is of conservation value is that to survive in certain areas of Scotland the selection pressures are such that some of the traits favoured in the process of domestication may be selected against." In addition to the conservation argument, the status of the wildcat is of great cultural significance to the Scots. For Scotland is the only part of the UK which supports wildcats of any description, and over the centuries Scots have perceived the wildcat to be particularly special to them, if for no other reason than for its independent lifestyle. © The Herald: February 17 th, 1998.